This was, I believe the only exception (I might be wrong about that, but I don’t think so.) As you will be aware she was quite determined that most of her books were to be small enough for small hands to hold with ease – and that has on the whole been continued to this day – though there are a few ‘spin-off’ titles that are larger, incredibly, there are even some illustrated by someone else. Further there are other Peter Rabbit books that have been written by different authors. 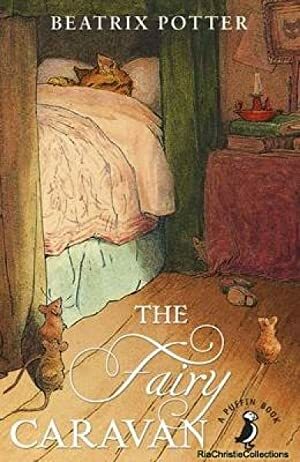 It has to be said that hers, the original books are perfect and don’t need to be abridged, re-written and certainly don’t need their illustrations changed. Sorry – this was meant to be a post about The Fairy Caravan – so I shall return to that. The guinea-pig takes a dose of this potion, with interesting results. My copy was a hardback, with a bright yellow dust-jacket. Puffin have recently published a new edition – in paperback with her illustrations too, including a section of coloured plates. Which is wonderful – just what this age group needs – good writing, and well illustrated.